KUALA LUMPUR: The whole fad of hipster culture has brought life to furniture of old and rustic designs using palette and raw materials. 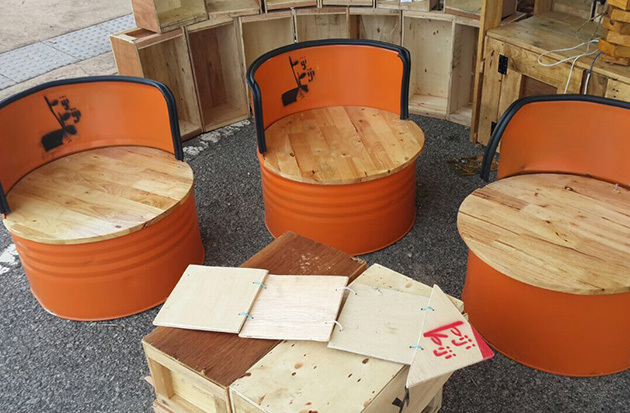 With such industrial designs in demand for home decorations, furniture made from wastes too are starting to gain popularity in the Malaysian market. Priced between RM20 and RM300, DIY (do-it-yourself) products made from old and unused items such as banners, plastic bottles, diesel drums, wooden palettes and metal scraps; mostly items found at home or factory rejects, are beautifully transformed into cabinets, tables, chairs and even bags. Welcome to Biji-biji, a social enterprise aims at sharing progressive and innovative ideas using recycled materials. Make your way to Biji-biji initiative workshops and you're in for a treat! Here, participants get to explore their creative side and learn basic tool skills to create something new from waste. 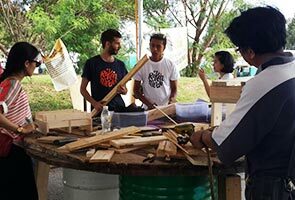 According to creator and builder of Biji-biji.com, William Kong, 'upcycling' is a concept largely applied in the process wastes are reused for reproductions sans energy. "It's different from recycling where the used item is broken down into smaller parts in the factory and the material reused to create the same product, which is a cycle. "However for upcycling process, we are totally running away from that cycle, which means no breaking down of parts is required. Meaning there will be no energy wasted, only manpower," said Kong. With the help of internet as a source for creative ideas, Kong said the possibilities are endless. Most importantly, they also bring in the money. "We already have a sellable product which is the diesel drum chair. It wasn't our idea but something we found in the internet and tried it out. Plus, in open source there are no copyrights. "For example, you can also collect plastic bottles and put them together to create a nice lamp. So all these ideas you can find them online either on Google, Pinterest or Instagram." Biji-biji's own product is their unique handmade seat belt bag which looks as good as normal bags but made from stronger material. "The seat belts we used were factory rejects as they did not meet the colour specification or comply with RTD's (Road Transport Department) law. So we used them to make bags," he said. For student Hani Hazira, she was excited as it was her first time making her own jewellery box from wooden palette at one of Biji-biji's workshop recently. "I think it's really good. First, you can save the environment plus instead of buying a ready made item from a shop, you can actually make one yourself. At the same time you can learn something new," said the 21-year-old Hani. Not just a unique and creative way to reuse unwanted items, the concept of upcycling is more importantly, to reduce waste in the long run. "This concept is very important since as far as hundreds of years ago -- during the industrial revolution in 1800s -- mankind has started to think creating new things using natural resources and waste was not an issue. In those days, however there were still many trees, forests and landfills but now they are getting lesser and lesser." "That is why it is so important to continue this upcycling lifestyle. Although it is simple, but if 100,000 people do this, the act will be multiplied by 100,000-fold. When there is a demand for products made from waste, there will be a supply. This is the best way to reduce waste and the same time bring profit for builders and creators," said Kong.